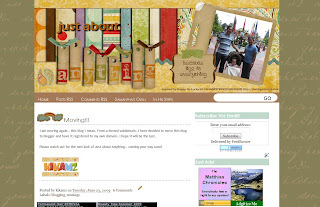 Just About Anything: A New Look! Hello everyone! I know I have been silent and absent for sometime now. No updates even since Monday, last week. Well, I have been busy moving to my new place here on Blogger and I am happy to announce that all is well! I am now back with a new look! It is quite different from my previous look but I hope you like it! The layout is free and designed by Simply Fabulous Blogger Templates and then I did some tweaking on the header. The scrapbook elements from the header were inspired by the Happy Go Lucky Kit from Shabby Princess Designs. And oh, kindly update my blog URL to http://www.kikamzpera.com/. great new look! i love it! :D ill update my link.. see you around!